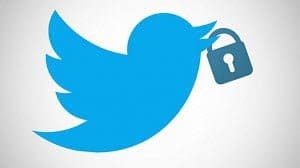 Social Lockpicker is a Google Chrome extension that allows you to unlock content that requires a Facebook Like or tweet before you’re able to view it. Social Lockpicker is a Chrome extension that allows you to view content that requires a Facebook Like or tweet. Here’s how to get around that annoyance. Don’t get me wrong, I totally understand that a site would want to increase its social network presence. On the other hand, I’d rather it not be forced to “Like” it on Facebook or “tweet” it to my Twitter followers. Locking content and forcing me to perform social network related-tasks to see it is definitely an annoyance. But I’m not judging at all; I’ll just give you a solution. This is especially useful when you’re on that site for the first time and you probably won’t be back too soon. It’s a shame for you to get your Facebook feed filled with its content afterwards, only to have to undo the action you’ve performed. 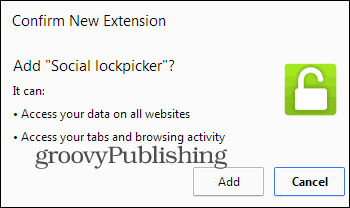 Social lockpicker is a Google Chrome extension which aims to solve the problem. Start by installing Social lockpicker from the Chrome Web Store. It will install like any other extension. 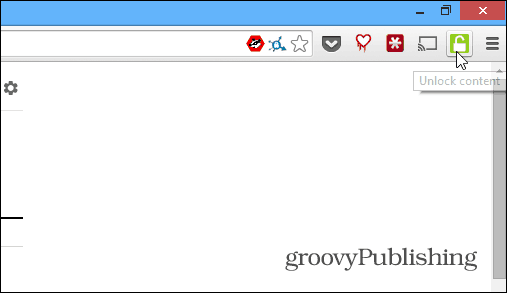 Now just click the little green lock button in your Chrome toolbar, next to the address bar. The content will be unlocked instantly, without any other action required on your part.. While you might not run across this often, it all depends on the site you’re viewing and the media content you want to view. Having this work around allows you to still see the locked content, without the social hassle. If it’s good stuff, you might just like their Facebook page or follow them on Twitter. What is your take? Are there any situations online where you’ve run across the locked content gimmick? Leave a comment below and tell us about it. Hi, I have a facebook account but never use it and I am not a member of twitter. Anyway I bought a product from this website but it came with no instructions. Instead they directed me to this site http://iatkos.me/index.php/m-guide but I cannot see the content. Your product doesnt work to unblur it. Use chrome to open the page you mentioned above, right click on blurred text then click inspect element. Once the window popped out, press ctrl+F to search for “blur-area” without commas. On that specific line you will see the blur effect which is 5px (pixel). Right click on line “<div class="onp-sociallocker-blur-area" style="-webkit-filter: blur(5px)" and click on "Edit using HTML" to modify the blur value from 5px to 0 pixels, than click anywhere else to exit edit mode. Enjoy your content, cheers!